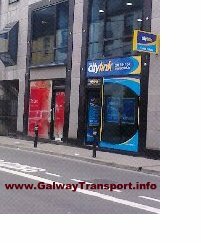 Citylink's Galway City ticket office has moved from the Tourist Information office to a shop in Forster St, just opposite the Park House hotel. Saturday and Sunday: 9am - 6pm. Pre-booked tickets may be collected here, and on-the-spot sales are also available.